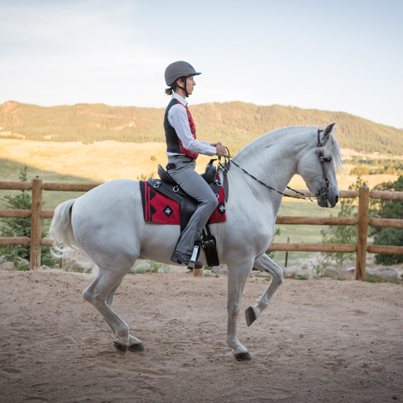 Jec A. Ballou brings riders and horses measurable progress — while avoiding boredom, confusion, or injury — though correct physical conditioning of the horse. Her training emphasizes science-based exercises to improve movement and performance. She advocates cross-training for every horse and rider with training plans free of short-cuts or methods that restrict the horse’s movement. First, a rider needs to be educated and developed. Next, and often simultaneously, his or her horse also needs to be educated and trained. These are separate jobs. Development of riders is not synonymous with training horses. Education of each entity must be treated distinctly and appropriately. Separating the education requirements of horse versus rider demystifies much of the training process. This is necessary for a holistic and compassionate training journey.